To add expenses & benefits to an employee record, go to Employees > choose the Employee from the listing > select Expenses & Benefits on their menu toolbar. 3) Enter the cash equivalent of the van(s). The van benefit charge for tax year 2019/20 is £3,430 - this should be reduced for periods when a van is unavailable. 4) Enter the cash equivalent of fuel where applicable - the van fuel benefit charge for tax year 2019/20 is £655. 7) Using the information entered, BrightPay will now calculate the cash equivalent of the van and fuel, where applicable. It will then determine the number of pay periods still remaining in the tax year and distribute the cash equivalent of the benefit equally across these remaining pay periods. 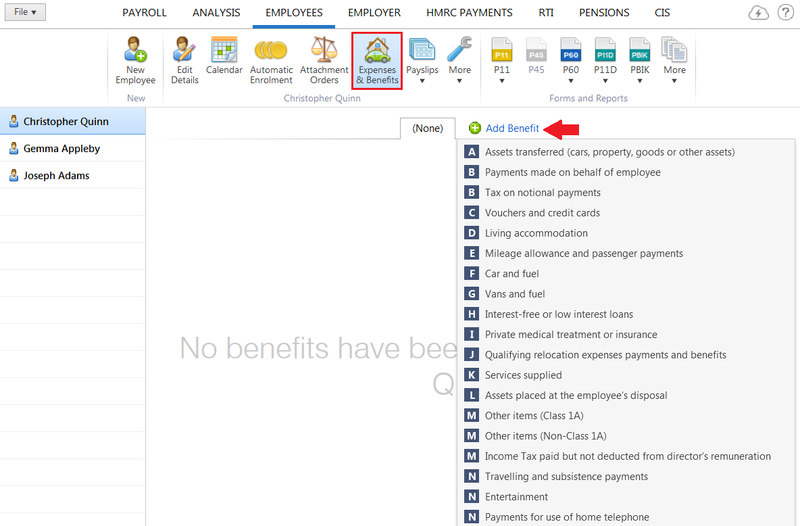 9) To view or edit the benefit details, simply click the Edit button next to the amount. On finalising the employee's payslip, the benefit figure will subsequently appear on their payslip and will be reported to HMRC via the relevant Full Payment Submission (FPS).